Jamie: Ruts DC in Vienne, France. Amazing. Punk Globe: Memorable 2016 occasion? 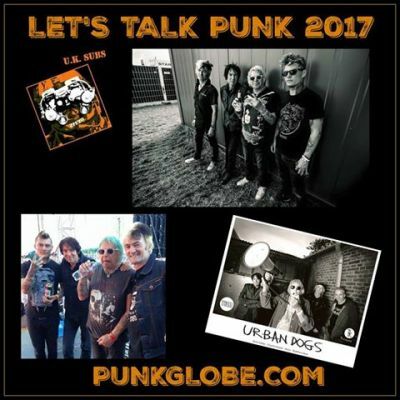 Punk Globe: Any 2017 goals? Jamie: Figure out a way to stay in European, skydive as much as possible, cut down on my alcohol consumption, learn to drive, buy a camper van, travel and just generally continue loving life! Punk Globe: Best show you saw in 2016? Charlie: The Damned's 40th anniversary show at the Junction in Cambridge. Urban Dogs opened up for them. Punk Globe: Anything you regret doing in 2016? Charlie: Not buying a right hand drive Ford Mustang. Punk Globe: Memorable 2016 occasion. Punk Globe: Any goals for 2017? Charlie: Our 40th anniversary world tour. Alvin: Criminal Mind at the 100 Club supporting Urban Dogs at the launch party for the Urban Dogs' new album 'Attack', available now on Time and Matter Records. Punk Globe: Favorite 2016 movie? Alvin: The Wolf of Wall Street. Alvin: Recording the critically acclaimed brilliant new album 'Attack' by Urban Dogs with my friends Charlie, Knox and Matthew. Available now on Time and Matter Records. Crystal Palace win the Premiership. Stephen: Missing playing for UK Subs at Hellfest earlier this year. I had prior commitments at the time of joining the band. Stephen: Joining the UK Subs, and playing at the Great British Alternative Music Festival. Stephen: Just to get better and better on the guitar.